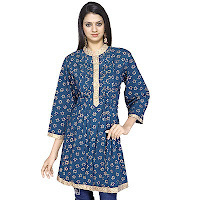 Indian Fashion Kurti , also known as Tunic tops, is very much in fashion these days. It is very comfortable and looks very stylish. 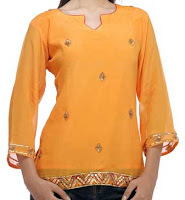 The term Kurta tunic tops or Kurti are used to describe the shorter kameez. Most women prefer to wear these without the chunni. It's a Shirt-like garment reaching till the hips. It can be of short, long, three fourth sleeves or without sleeves. Its often has a round or a "V" neckline. The best part of kurti is that they are extremely comfortable yet they look stylish. They are suitable for any occasion and any hour of the day. Young girls wear kurtis with blue denims, long skirts , tight leggings and 3/4 capri's. It's a perfect blend of Indian and western fashion. Especially in summer kurti's are the best attire any women can wear. Kurti is just a top. Girls nowadays wear Kurti in collages, office wear, and daily wear over jeans, salwar , pant, capri and even a skirt. Indian Kurtis are accepted worldwide and it looks great. They look smart enough to be worn for family functions, religious functions or even for a party get together. Kurtis look decent yet traditional. It can be short or long with different styles and patterns. There are various varieties like embroidered Kurti , designer kurtis printed Kurti, cotton Kutras, lenin Kurtis, georgette Kurti, traditional Kurti, ethnic Kurtis and fashion Kurtis are the variants of Indian Kurtis. A Kurti gives attractive and decent look to any woman. Different types of fabrics are used like cotton, Georgette, crape, silk etc. Indian Kurtis will lend grace to any women wardrobe. Apart from being comfortable whatever body structure you have, whether you are skinny, plump tall or short kurtis or tunic looks great on you. They can be worn on any occasions formal, casuals, office wear or evening wear. Indian tunics are especially cotton made for casual summer. Now a day's even chikan work kurtis are popular among youths. Slim fit denims, pants, and leggings go well with loose kurti tops and long tunics. For evening or party wear they are elaborated with details like crystals, beads, pearls, patch, resham, kundan, stones, semi precious stones, gotta work, mirror work,diamonds, thread work, sequins, embroidery, zari work etc. Indian Kurtis are made keeping the hot and sultry weather of India in mind. That is one of the prime reasons that most of Indian Kurtis are made of cotton. Few popular varieties of Indian Cotton Kurtis are Printed Cotton Kurtis, Embroidered Cotton Kurtis, Bandhini Cotton Kurtis , etc. Apart from these, there is another variety of cotton Indian Kurtis known as Crushed Cotton Kurtis which is extremely popular because of its look. A Crushed Cotton Kurti is essentially cotton Kurti which is deliberately crinkled to give it a crushed look. Alternatively, it is also made of cotton fabric that possesses a crinkled texture while manufacturing, but making it in plain cotton first and then crumpling it to give it a crinkled look is an easier option and hence widely practiced. Crushed Kurtis are usually made of thinner varieties of cotton since it is easier to achieve the crushed effect with lightweight fabrics rather than thick and heavy fabrics. Apart from cotton, crushed Kurtis are also made of other lightweight fabrics such as georgette, chiffon, light silk, etc. Crushed Kurtis, due to their appearance, make great Casual Wear or semi-casual wear outfits and imparts a sort of bohemian look. It looks amazing when paired with a pair of jeans or even leggings. The shorter varieties of Crushed Kurtis pair wonderfully with long gypsy skirts. Crushed Kurtis are perfect for those who prefer and can carry off the casual chic look successfully. Nice Blog on indian fashion kurti Online. Thanks for sharing good stuff with us. Very nice post. Really liked it.